Last year we saw some of the most amazing hairstyles — ombré, feather extensions, pastel hues, braids galore — and they left us wondering how 2012 could ever beat it in the tress trends game. 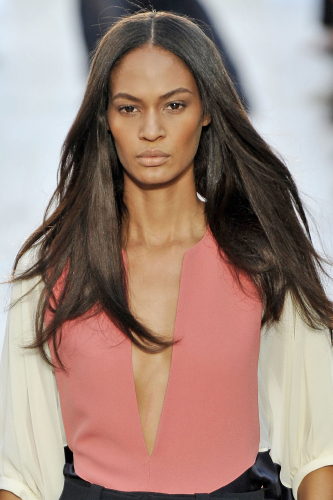 Well 2011, consider yourself served: Judging from the spring ’12 runways, it’s going to be one helluva year for hair. From punked-out bangs to retro twists, we asked Tresemmé celebrity stylist Jeanie Syfu to dish on the cuts and coiffs that are going to be major for the next 12 months. Check out her picks and get inspired to switch up your (hair)style. 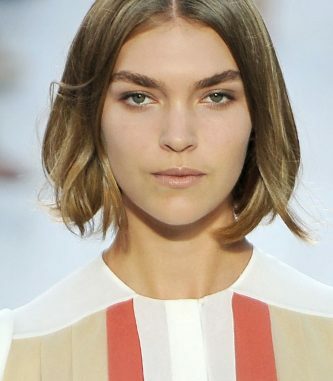 The classic bob really never goes out of style — it just gets reinvented every year. Syfu says this year’s iteration is going to have more of a square shape and will be slightly rounded in front (think flapper or film noir). Instead of super-textured, beachy waves, expect to see lots of smooth, “bended” waves. Syfu says this looks works best on mid-length and long hair. To get the look, prep wet hair with a light-hold mousse (she likes Tresemmé Naturals Lightweight Mousse), then blow-dry upside-down using a round brush. Flip hair upright when dry, then, using a 1-inch curling iron, begin curling hair from the mid-lengths down to the ends. Brush through with a paddle brush for a natural finish and spray with a flexible hold hairspray for hold. Braids, you will be missed, but 2012 is the year of the twist. 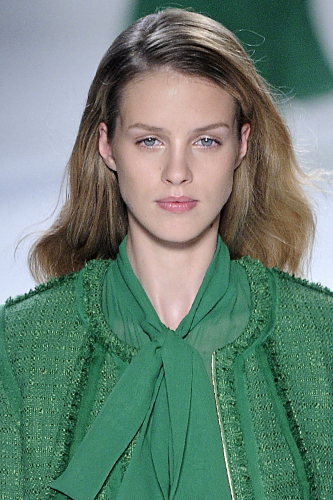 They were all over the spring runways and, like the braid, they can be interpreted in about a million different ways. Twists benefit from being a bit easier to do, so we suspect more people will be more willing to give them a shot. After a few seasons of piece-y, choppy bangs being the fringe of choice, we’re going to start seeing a much heavier bang in 2012. “They’ll be slightly rounded through the temples, which can accentuate cheekbones and eyes,” say Syfu. Unlike 2011, when the pixie was THE cut, there’s no specific haircut that’s going to dominate this year. Instead, Syfu says that there will be a variety of cool coiffs to covet. One thing they will all share is a heavier weight line — the area of the cut that has the greatest length. Heavy means that you will clearly be able to see where the hair was cut, so there will be less texturizing, meaning the hair will move and swing more. We saw so many instances of wet-looking hair (and copious use of hair gel) backstage that we started to reconsider our long-standing ban on Dep. To avoid looking like a greaseball, Syfu says to limit your gel use to an accent, rather than glopping it on all over your locks. We like the juxtaposition on models at Elie Saab, who had slick, side-parted roots, with the rest of their hair left very soft and feminine. 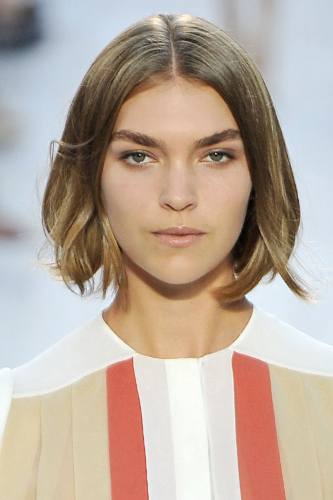 Volumized blowouts are 2012’s most versatile, maintenance-free trend. Because there is so much body, they tend to last for longer, meaning you can rock this ‘do for two or three days if you use your dry shampoo judiciously. Syfu says it works great on all hair lengths, but just make sure you start with a great cut. Looking for a more adventurous style this year? 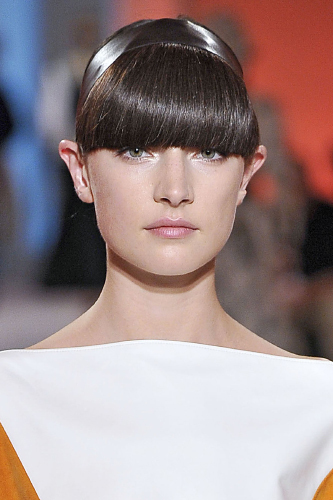 Syfu loves this rolled, asymmetrical ‘do from Rodarte’s spring ’12 show. “It plays well with all the feminine/vintage-inspired looks we will be seeing this spring, and works well on the second day of your blow out,” she says. 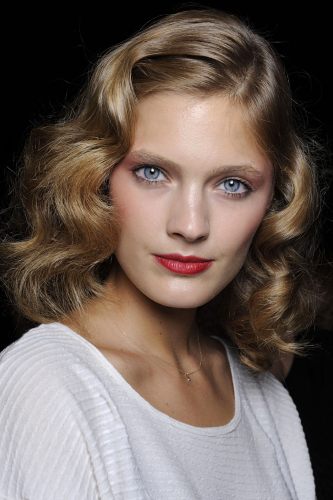 To get the look, prep hair with mousse and blow-dry with a round brush to create a good foundation. Create a deep side-part, then section from the end of the part to the top of the ear and clip the hair to the side. Using a brush, take 1-inch sub-sections and tease them lightly to create volume and lift. Spray with hairspray, then lightly backbrush the hair to smooth out the surface. Loosely twist the sectioned-off hair back and pin it at the base with a bobby pin.